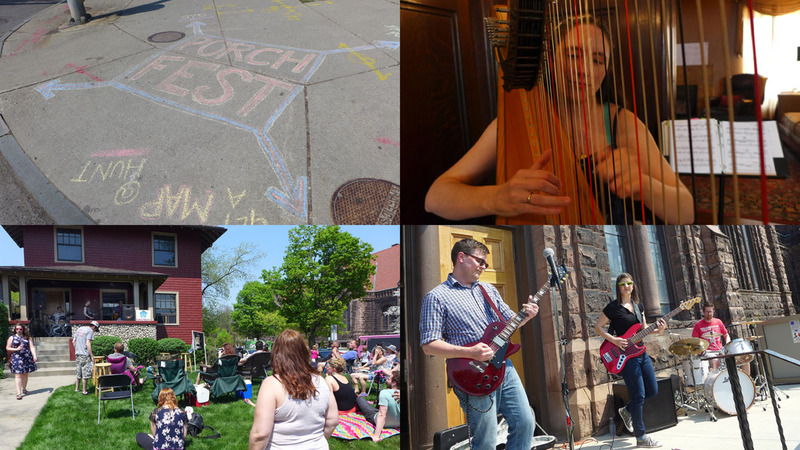 Sidewalk-chalked arrows and various hand-painted signs pointed the ways to about four dozen Elmwood Village and West Side homes and businesses this past Saturday, May 9, for Buffalo Porchfest. The third annual DIY affair, presented by Elmwood Village Association, featured talent performing afternoon and early-evening sets. With more grass than asphalt, and peaceful crowds rather than sizable throngs, Porchfest is a more dog-friendly event. Dogs, like open adult beverages, showed up intermittently around featured porches. One of the hottest porches of the day was Lafayette at Elmwood, “The center of Elmwood Village,” according to bon vivant John Liberti, sipping a beer. “This is my buddy Sabby’s home.” Throughout the day there were about 60 watchers on the lawn and sidewalk. Joseph and Ellen Lettieri of Inn Buffalo on Lafayette had attorney/songwriter John Kolaga playing solo acoustic on their grand front porch as a circle of listeners watched, a pile of his CDs, Beautiful Dangerous Girls, at his feet. A terrier neighbor wandered about the porch. Inside harpist Kela Walton played “a little bit of everything, ‘Stairway to Heaven,’ The Beatles,” in the foyer as a steady stream of people wandered about the inn for impromptu tours of the massive restoration work underway. The Bear (DJ, Kevin, Mike, Sam, and Greg) performed a set on Dorchester, songs off The Maul of America, their all-originals recording. Greg the drummer was playing a very portable and banged-up pink kit made for girls: practical. Around the corner, at Lafayette Avenue Presbyterian Church, trio Science Lion (Chris, Rebecca and Matt) played on a holy stoop. 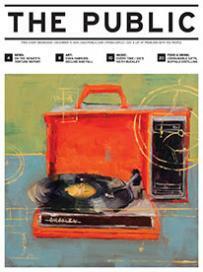 On Saint James, at #106, John Allen and Mark Harris played guitar and bass quietly. Nathan, AKA CTHuhlord, who played a set there earlier, emerged from the house with a plate of food – part of the gig he said. Westward, across Elmwood, at 464 Auburn at Livingston, Mike Schenkel played a combo dulcimer/walking stick that “took forty hours worth of work” after researching at the library to create the dual-purpose instrument. After his set of originals, including “Springtime Rain” about a soggy trip to Sweden, Schenkel showed the components of his instrument from Len-Co Lumber, Allentown Music and a hinge from a hardware store. After Mike, Brunkin Dunch (John, Dean, Keith and backup singers Annie and Stephanie) played jaunty pop tunes and the house pitbull, smiling Mr. Pickles, greeted newcomers. Among those watching Dreambeaches at 169 Bidwell Parkway was Thirsty Buffalo bartender Joe Wielgus, wearing a tank top that showed off a hint of Buffalo-themed tattoos. It took little prompting for him to lift his shirt to show a Buffalo Bills logo on one shoulder and a standing red bison on the other, acquired “in 2007 at a place in North Tonawanda, I don’t know where.” A woman stood nearby holding her sweet Chihuahua rescue. Down the avenue a duo performed discreetly alongside Poster Art on Bird Avenue (a rogue/DIY addition to the Porchfest schedule): Anthony Henry on bass and John Smigielski on vibes. Sculptor and Elmwood regular Dave Derner watched from a lawn chair positioned on the sidewalk. “We’ve been playing about an hour,” said Smigielski. What’s their band name? “We’re freelance,” said Henry, his bandmate adding “We’ll have a name by the next time we play.” And, one would hope, by next breezy Porchfest.